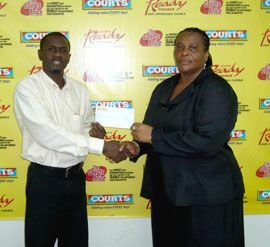 Courtsâ Marketing Executive Alexis Harry-John said. âThis is why we have been shouting about the many reasons to shop at Courts. There is always a reward awaiting our customersâ. Harry-John stressed the âReady Finance is a credit facility with a pre-approved spending limit based on your economic situation (income, expenses etc). It is very unique, easy, affordable and flexible. It is designed to meet the everyday customer wanting to shop on creditâ.